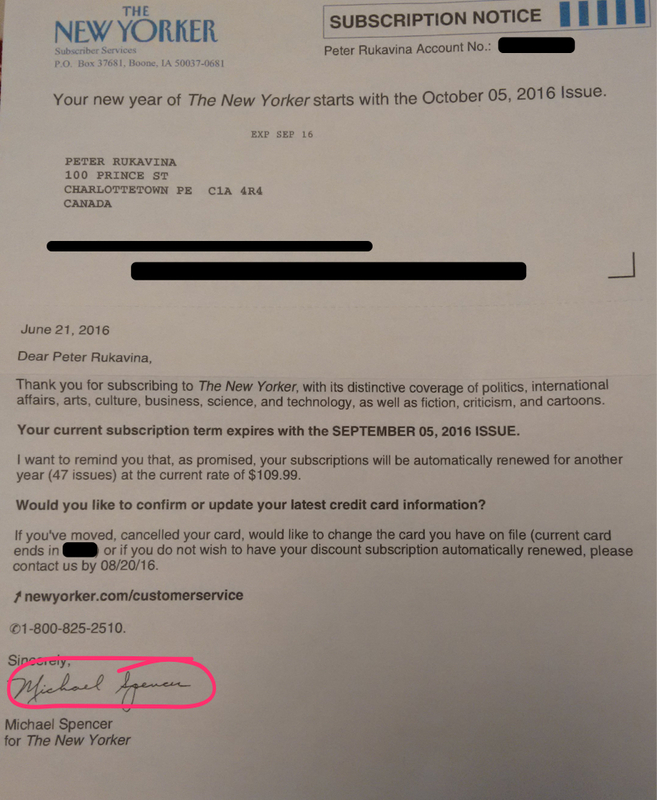 Every year around this time I receive a letter from The New Yorker subscription department informing me that my subscription is to be automatically renewed in the fall. And every year that letter is signed by Michael Spencer. 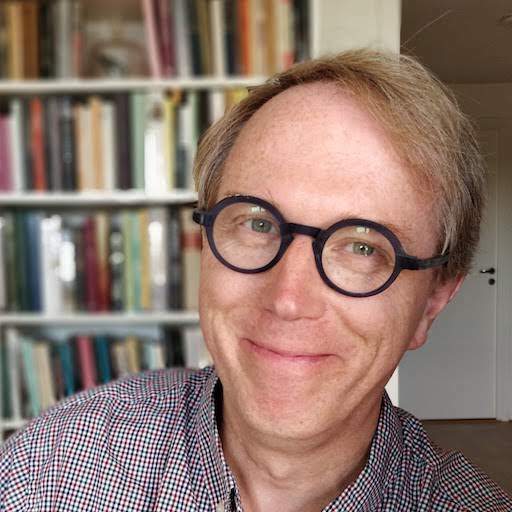 I am a longtime and contented subscriber to the magazine. Reading it every week is one of the central activities of my life. So I’ve no grudge with Mr. Spencer. Other than wondering whether or not he exists. There’s always been something vaguely suspicious about the generic nature of his name (like the G. Raymond that TD Visa uses in its marketing). And about his lack of job title. And about the fact that he maintains the same role, signing these letters, year after year after year. Why is he never promoted? His name even appears in materials released by WikiLeaks under the The Global Intelligence Files project. That’s surely suspicious. Others have wondered about this before. They’ve been irate, however, whereas I’m simply curious. Like those others, my first impulse was to call Mr. Spencer at the number on the renewal form. After wading through a robotic telephone tree, I provided my subscription information to an agent and asked to talk to Michael Spencer. “In what department?”, the agent asked. “He signed my subscription renewal letter,” I replied, “and I’d just like to talk to him about the design of it.” (Which was true – the bit at the top about October appears to conflict with the bit in the middle about September). After about 7 minutes on hold I was transferred to “her supervisor” who asked me for Mr. Spencer’s extension number. I replied that I didn’t have his extension number, as it wasn’t listed on the letter. She asked me what department he works in. I didn’t have this either, obviously. “I just wanted to provide Mr. Spencer with some feedback on the subscription renewal notice,” I told her. “I could pass that along to our publisher,” she replied. “Perhaps I could just call the magazine directly,” I suggested. “You are calling the magazine,” she answered. At this point I rang off, as it was clear that Mr. Spencer was not there. So I’ve no recourse but to send Mr. Spencer a letter. I will let you know his reply. Written July 14, 2016 at 1:44 p.m.